Last weekend we headed to the coast for a few days to Diani, near Mombasa, to take advantage of the beautiful beaches before starting at Kiva. While the beaches were great, what was unique about this trip for me was the long journey required to reach this paradise, and the important lessons learned. 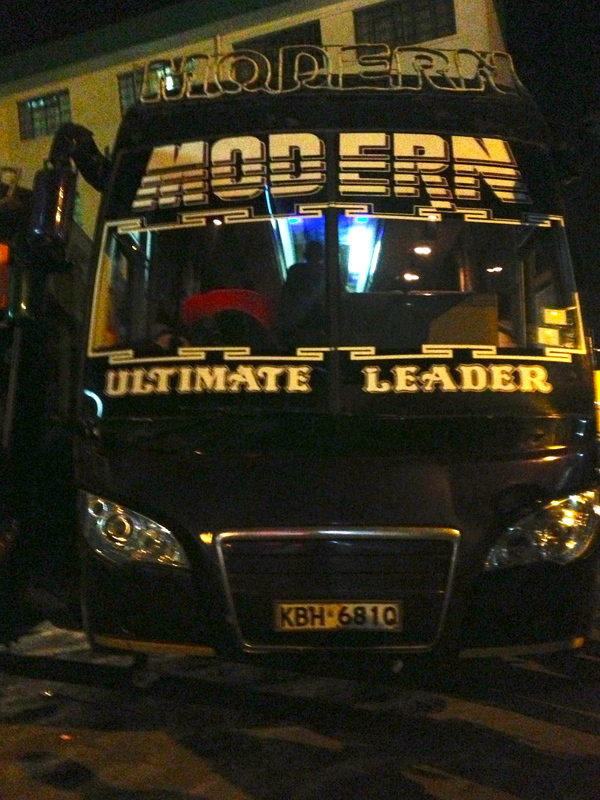 First, we took a ten-hour overnight bus from Nairobi to Mombasa. 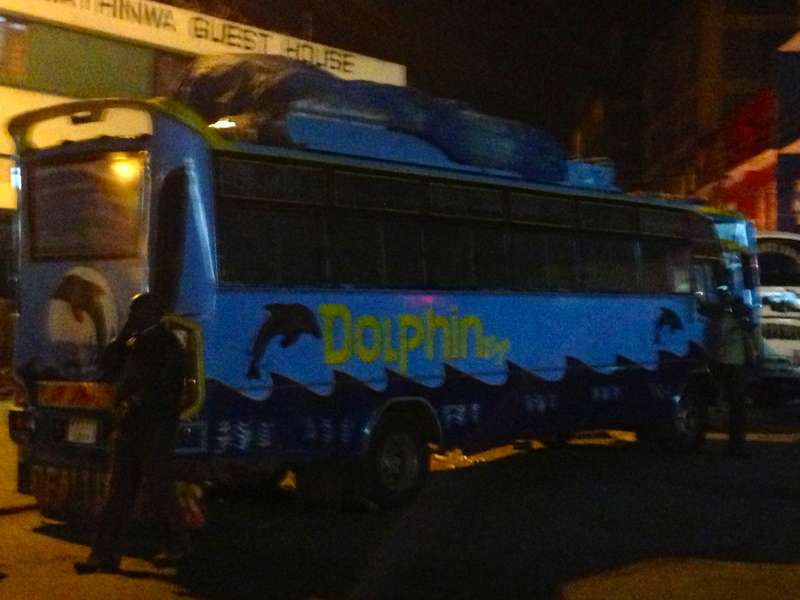 Lesson #1: There are some really crappy buses in Kenya, and they seem to be named after animals, like Snake or Dolphin. Luckily, ours was The Ultimate Leader. But still, the drive had some scary moments. Lesson #2: Don’t watch oncoming traffic. It’s a two-lane highway overcrowded with large buses and semi-trucks, and the Kenyans aren’t shy about passing vehicles, sometimes a whole string of them, with seemingly little regard for oncoming traffic. It’s best not to look. 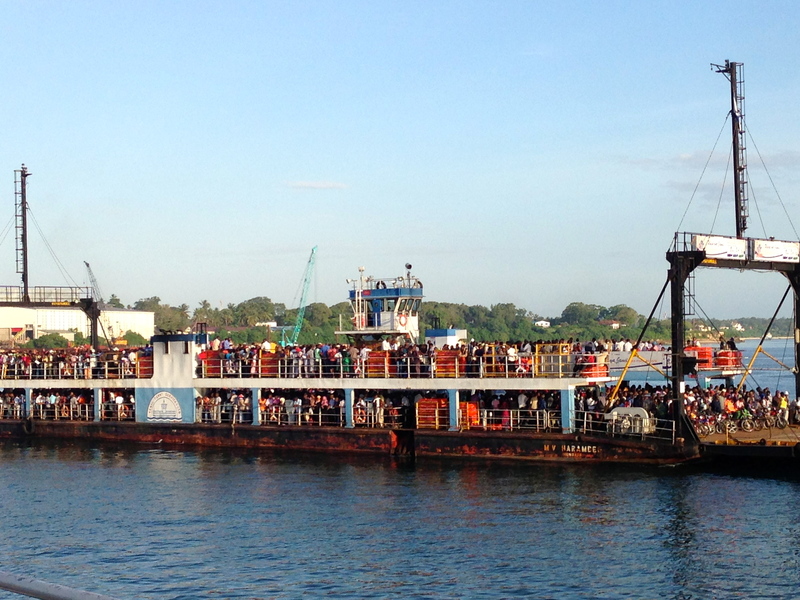 From Mombasa, we took a short ferry ride to Likoni. Lesson #3: Be brave, and a little pushy when fighting your way through the sea of people. And stick together. (Daniel needs some practice with this.) I’ve never seen so many people swarming in exactly the opposite direction that I’m going. I was slightly intimidated and amazed. 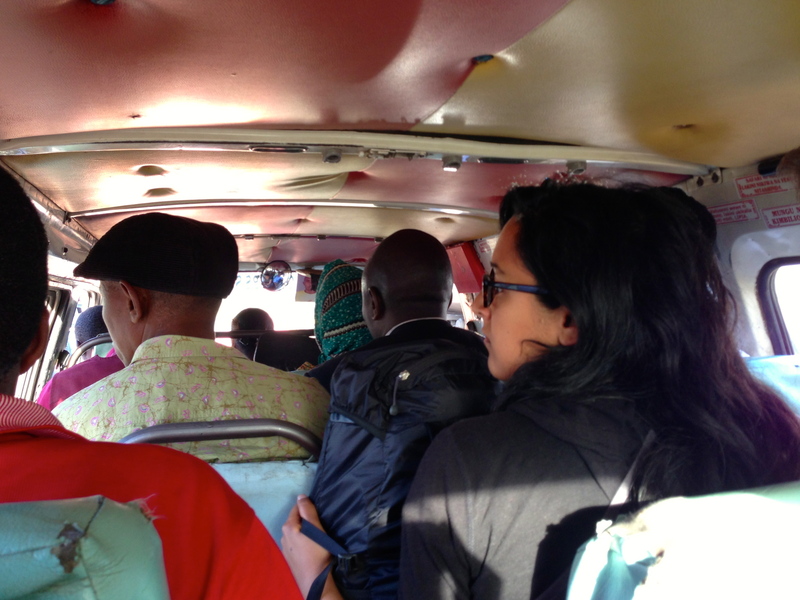 We also experienced our first matatu ride. Matatus are basically minibuses, each decorated in its own style, with fun African music playing. They are one of the primary modes of public transportation in Kenya, and are notorious for their aggressive and sometimes dangerous driving. Lesson 4: Look under your seat. 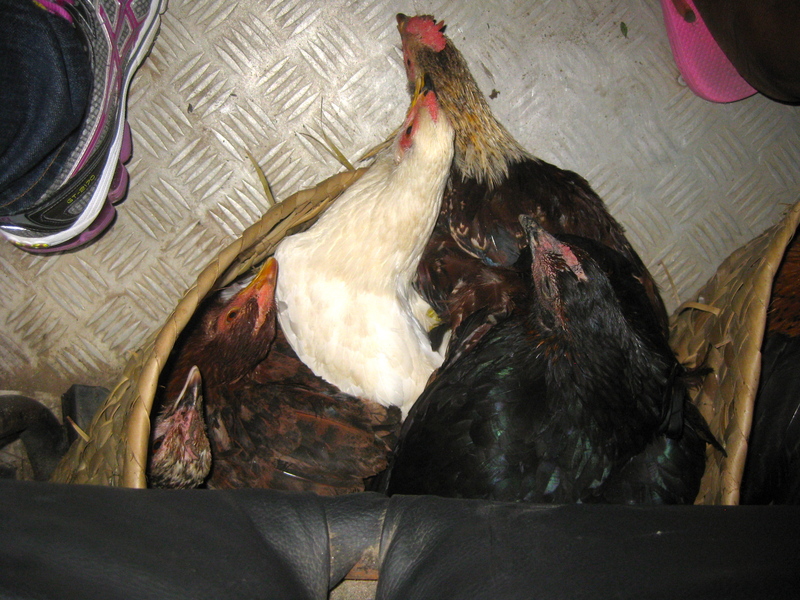 I had a basket of chickens under mine, which I discovered near the end of the journey. I’m pretty sure I stepped on the poor guy on the right. But I’m also pretty sure he wasn’t around for very long to feel the pain. 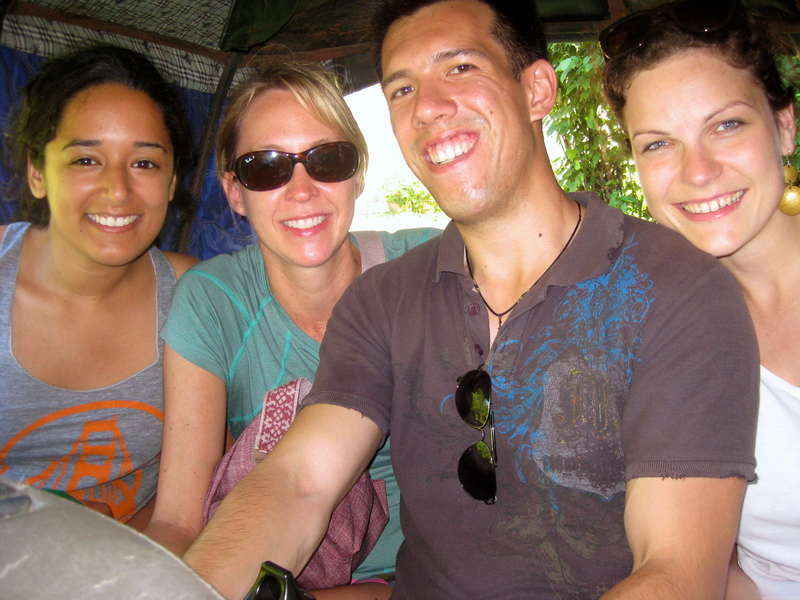 We took many tuk tuk rides while in Diani. A tuk tuk is a three wheeled, open vehicle with a three-person cabin on the back. We managed to squeeze four of us and our backpacks into one. They’re slow, dusty, and you inhale a lot of exhaust fumes, but they’re cheaper than a taxi. Lesson #5: Not all tuk tuks are created equal. We had one especially slow and weak tuk tuk that was passed by a couple of bicycles and accidentally popped a wheelie trying to go over a bump. And finally, Lesson #6: When on a long journey, choose your seatmate carefully. 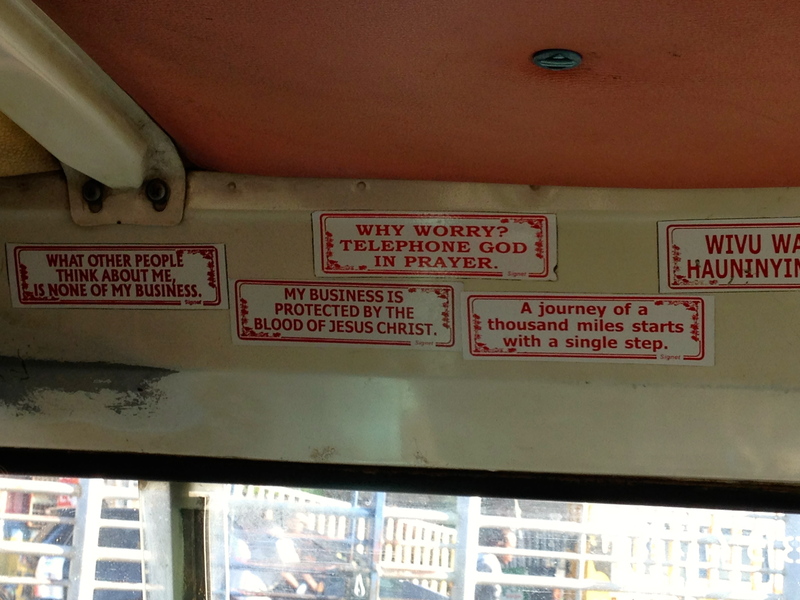 On the long ten-hour bus ride back to Nairobi, mine vomited on me, with an hour left in the journey. Seriously. Chose wisely, my friend.